2010 Montesalario, Sangiovese, Montecucco DOC, Tuscany, Italy. Montecucco is an up and coming area in the Tuscan Maremma coastal region, closely surrounded by Grosseto to the southwest, Sascano to the south and Montalcino to the north and northeast, This adds up to great Sangiovese country, in fact most of the Sangiovese planted here are identical to those found in Montalcino, the famed Sangiovese Grosso. This area is just being explored and discovered and the wines are showing glorious potential, this is a region to watch for high quality and value, one of the better examples to look for is from Montesalario, imported by Siena Imports, San Francisco. The 2010 Montesalario Sangiovese Montecucco DOC is flat out stunning and gorgeous with a dark garnet hue, rich texture, vibrancy and density showing a mix of berry, cherry, plum and strawberry fruits, chocolate, tobacco leaf, lavender, licorice and cedar wood spice. This is Sangiovese at it’s best, fresh, detailed, layered and lengthy, not a wine to age forever, but a real pleasing wine to enjoy over the next 3-5 years. 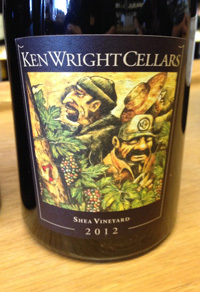 2012 Ken Wright, Pinot Noir “Shea Vineyard” Willamette Valley, Oregon. This wine has huge potential, though it will need some time to come together, and while I can see there are great times ahead it would be a shame to drink this bottle anytime soon, though I certainly recommend putting some away for about 3 to 5 years, as I am sure it will bring rewards. The nose is slightly reduced and has a bit of gunpowder and toast blocking the graceful fruit and floral tones that only faintly come to life with air. The palate is forceful, vigorous and firm at this stage, again with lots of coaxing and air there is sublime beauty deeply sleeping with violets, rose petals, cherry, red currant and black plum that very slowly reveal themselves in subtle layering along with cinnamon, apple skin, saline and licorice. There is some hints of game, spice, mineral, tea and loamy earth as well, this is going to be a spectacular Pinot Noir when it has some age, it reminds me of a young Henri Gouges Nuits-St.-Georges Perriers. I sincerely hope I get a chance to re-taste this future star in about 6 to 7 years, I have no doubt this Pinot Noir will be legendary. Ken Wright rates this vintage very highly, and I can see why, but for his set of 2012 wines you’ll need to have the patience of the gods.